It is common to think that because you are going gluten free, it is impossible to eat out at all. However is this really true? I love eating out and if I can travel across Europe, eat out nearly every day and not have a drop of gluten, then you can eat out in an English speaking country where ‘GF’ is written everywhere. Food brings people together, makes things fun and is integral to most cultures. However, you do not need to miss out on the fun or experimenting with food just because you have decided not to eat certain foods. It is absolutely crucial not to isolate yourself due to dietary requirements. I haven’t eaten any wheat or gluten (apart from Einkorn or Emmer wheat as they are the most traditional wheat grains) for nearly 5 years. I also enjoy eating out with friends and family at least once a week as well as frequently travel. So how do I do this and still maintain a gluten free lifestyle? Below are my top 7 tips for staying 100% gluten free. Remember, if you are going to be gluten free, you need to be strict with it, otherwise inflammation within your body will still remain and your immune system will never reset itself back into balance. This may not seem too important, though it is in fact the most crucial component to following through with any good habit. Now that you understand WHY you are to avoid wheat/gluten through watching the ‘What’s With Wheat?’ documentary, it is now important to give your body what it deserves so you’re free from inflammation. You can have all the knowledge in the world, but not implement anything at all. Make this your absolute priority and everything else will fall into place. Realise, know and believe that your body deserves the respect, love and nourishment it needs in order for you to be the best version of yourself. Start by honouring your body every single day by doing something you love, pampering yourself in some way or connecting with your body through yoga and/or meditation. You need to put yourself first, or you will fail to be the best service to your partner, family, friends and work colleagues. When you’re the cook, you have nothing to worry about as you know the ingredients you are cooking with. The added bonus here is that you still get to have some fun with your loved ones as well as cooking nutritious food for them too. You can also share the amazing recipes with them so you create a ‘ripple effect’ of people eating healthy meals. Ask them to split the costs of the dinner, by contributing financially. Make it simple! Roast vegetables, basic green vegetables or salads, condiments like pesto or mayonnaise along with roasted or slow cooked meats. Finish it off with a raw treat that can be frozen so you can do it a couple of days beforehand! A simple, nourishing, cost effective meal for everyone to enjoy. It is still possible to eat out, just choose your places mindfully. In your home town, discover who will support you and make those your favourite ‘go to’ restaurants. In any new location, make sure you research online or phone restaurants to ensure they can cater for your dietary requirements. That way, you can enjoy time with your friends and family whilst enjoying a meal out in peace! If a restaurant doesn’t support you being gluten free, then say no! You are best to go hungry or wait until you get home. 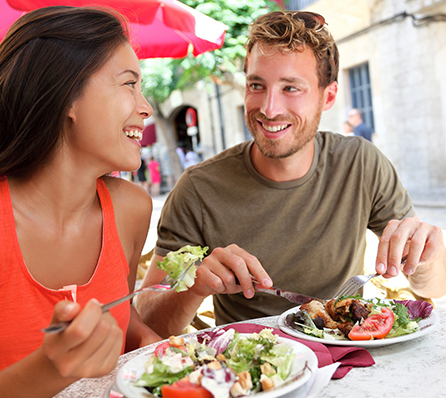 If you’re travelling, it is absolutely essential to find places that will cater for your dietary needs. Otherwise, when booking your accommodation, book an apartment with basic cooking appliances so you can prepare your favourite meals. Easier said than done, I know. However, remember your health is your biggest asset so ask yourself ‘Are the few minutes of enjoying eating a particular type of food, just to ‘fit in with your friends and the restaurant of choice’ really worth the ‘food hangover’ feeling you will have the next day, or even for the next few weeks? If you are at a café or restaurant that doesn’t have a suitable food on the menu and the staff are unable to cater for your needs, then remain strong willed and don’t get anything. Opt instead for a lime and soda or a tea and you will leave the restaurant feeling much more refreshed. Alternatively you can wait until you get home to eat something. Believe me, it is worth it. No matter the circumstance, ensure you choose the gluten free option. It is too common for individuals to slip up just once and then throw all their hard work away and continue consuming foods that do not agree with their body. Make being gluten free a non-negotiable, because if you are going to do it, aim to do it 100%! If you know you are going to be left with little to no choice, then take your delicious food with you! Some simple examples are savoury muffins, sustainable tinned fish in water, avocados, boiled eggs, soups or curries in a thermos, paleo sausages and salad, nuts and seeds, pesto with seed crackers. Make the food delicious so you will never have a boring meal again. If everyone around you eats gluten rich foods, do not feel embarrassed, guilty or ashamed. Be CONFIDENT in your decisions and stay true to yourself. You know what is best for you and your body. By being strong, you are only going to inspire and educate those around you to understand their own nutritional needs and eat accordingly. Enjoy the benefits of being gluten free, your body will thank you for it. I have found that bring food with me is a must in most occasions. I also tend to eat before we go out to a big event (husbands holiday party) as the catered meal is not going to be compliant. I also have found that when if asked if this is a preference or an allergy…I say allergy. I feel that it is, as I feel horrible when I eat gluten, even though I don’t have Celiac. Your list is highly appreciated! I have fibromyalgia and unfortunately gluten and sugar make my fibro flare up worse. My foods are very limited and my family seems to think it’s all in my head. But I know how I feel when I eat these foods but feel sad that I can’t eat them.